Longtime angel investor Chris DeVore has helped dozens of software companies in early seed stages. But when it came to planting a garden at his Wallingford home, the tech executive finally had had it with a project that was bearing more burden than fruit. “The amount of time needed to keep up a garden amidst a busy work life and two kids…it was just too much,” he says. In 2013, DeVore decided to transform the overgrown space into an outdoor kitchen that would yield a different kind of bounty: pizza pies. DeVore has had an enduring love affair with the Italian dish, which conjures memories of his East Coast college days, when he frequented competing pizza parlors, each claiming to make the best pie ’round town. Years later, on the opposite coast, DeVore met his wife, Emily, in California, and after moving to Seattle in 2001, the pair began a routine of cooking pizza on Friday nights at home. 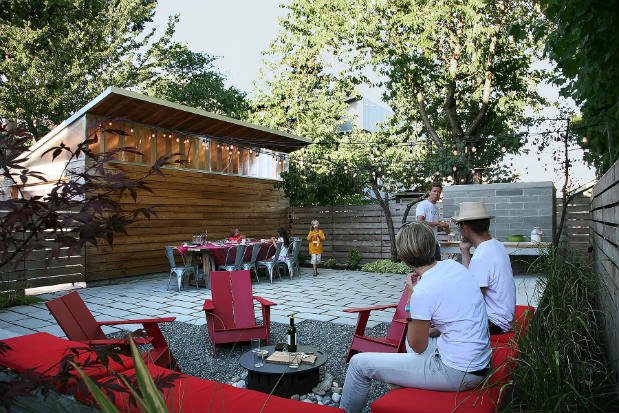 “The idea [for the backyard] came from taking that tradition and expanding it,” DeVore says. This Friday night (weather permitting), you’ll find DeVore baking fresh pies in his backyard, often inviting guests such as Hale to break crust at his family’s pizza night.